You probably never noticed the similarities of an Apple and a tooth until reading this right? Well if you have, you’re on your way to reading your fruits and vegetables #theway our savior intended us too. Similarities are no coincidence, as we all are of the earth, we all consist of very similar chemicals and properties found in the earth. Which makes it easier to understand nutritional values of whole foods, fruits and vegetables, as well as spices and herbs. 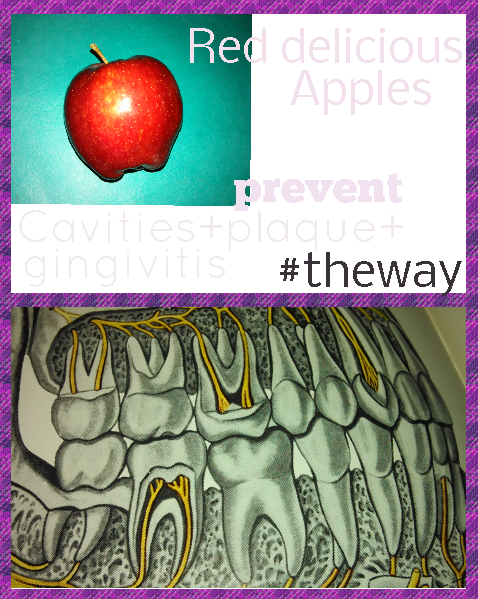 What we learn from the Red Delicious Apple photographed above is the tooth shape indicates that it possesses anti-cavity properties, prevents plaque buildup and gingivitis. The red color indicates that it’s going to benefit someone who is currently suffering from such diseases. The yellowish tinge of the flesh indicates potassium is present. The thick stem indicates that it has anti-inflammation properties. The dots on the skin indicate that it has an acid which will clean pores. The red edible skin indicates that it will protect the skin from uv rays. The almond shape seeds indicate the Apple is vital to optimal health. The round top indicates that it helps the body to produce hemoglobin. These are just a few nutritional benefits which can be concluded just be reading the characteristics and the shapes of the Red Delicious Apple. This information is not my research and can be proven by scientific research which is readily available to you online, so look it up if your curious. Disclaimer: All human bodies are unique and react differently; please consult a doctor before making changes to your diet. « Arizona fashionistas bound to go insane tomorrow!